The Day Care Center has been a staple of Pokémon ever since the originals and once again it returns in these games. 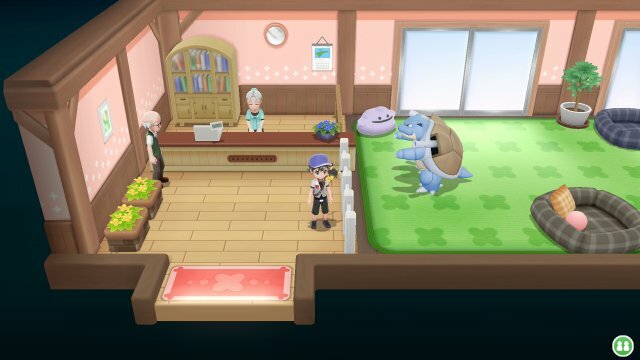 Located in Route 5, the Day Care Center will take just 1 of your Pokémon and will raise them. The Pokémon will raise by 1 experience point for each step you take and then you'll need to pay 100P plus 100 for each level the Pokémon raises to get it back. While this is a nice and quick way to raise a Pokémon while raising others in your team, there are more perks to leaving your Pokémon. Now, you will get berries depending on how long you have left a Pokémon there. The longer the time, the better the chance of getting a Golden Berry or even a Rare Candy. Golden Nanab Berry A Berry that calms wild Pokémon you’re trying to catch drastically when given to them. Golden Pinap Berry A Berry that makes you drastically more likely to get an item when given to Pokémon you’re trying to catch. Golden Razz Berry A Berry that makes it drastically easier to catch Pokémon when given to them. Nanab Berry A Berry that calms wild Pokémon you’re trying to catch slightly when given to them. Pinap Berry A Berry that makes you slightly more likely to get an item when it’s given to Pokémon you’re trying to catch. Rare Candy A candy that is packed with energy. When consumed, it will instantly raise the level of a single Pokémon by one. Razz Berry A Berry that makes it slightly easier to catch Pokémon when given to them. Silver Nanab Berry A Berry that calms wild Pokémon you’re trying to catch when given to them. Silver Pinap Berry A Berry that makes you more likely to get an item when given to Pokémon you’re trying to catch. Silver Razz Berry A Berry that makes it easier to catch Pokémon when given to them.